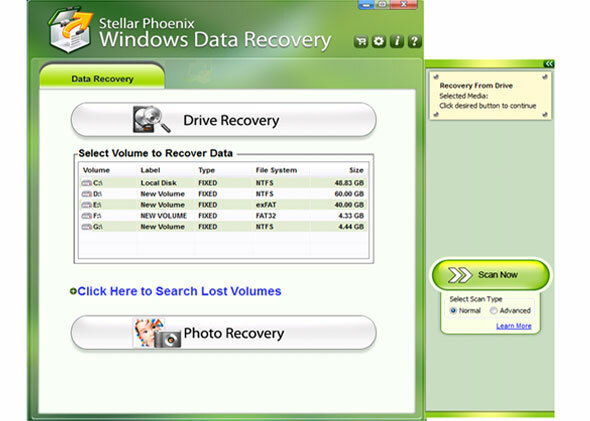 Stellar Phoenix Windows Data Recovery - Home enables you to recover your precious data, which is lost due to accidental deletion, formatting or corruption of the storage media, virus infection, and sabotage. This awards winning utility even recovers deleted partitions and supports recovery of data from mobile phones also. The software supports recovery of more than 185 different file types including MS Office documents, photos, videos, audios, database, etc. In addition, this utility enables a user to include a new file type before starting the scanning of the volume for recovery. Moreover, the software supports recovery of lost data from various types of external storage media such as pen drive, camera/mobile phone memory card, etc. This efficient software shows all recoverable folders and files in a 3-pane view. Here you can see a tree containing all the scanned folders, a list that contains all the files of the selected folder, and a preview window that shows the preview of selected file. If a user wants, then he can generate a filtered tree, which contains folders according to the defined masking parameters. Additionally, this robust software also facilitates some advance options as 'Deep Scan' and 'Filtered list of Scanned Files'. A user can use Deep Scan - if he is unable to see the desired file after the scanning of the storage media. This option, searches the storage media for every single bit of inaccessible, lost, or deleted data to provide the best result. Whereas, Filtered List of Scanned Files lists all scanned items in three types of tree structure, 'Classic Tree', 'File Type List', and 'Filtered Tree'. The classic tree displays a simple tree of files as they are on the disk, file type list lists the files according to their file type (such as Archive, Audio, Video, etc). Filtered tree displays filtered list of files based on user-defined file mask. The software has complete Do-It-Yourself, easy graphical user interface. How to salvages crucial documents from corrupted hard disk drive? Use advance recovery software free software that provides safe and speedy solution for retrieval of MS office files and folders that lost due to any data loss incident from HDD. Smart Data Recovery makes it easy to recover files and documents that have been erased or lost after an accident. Reformatted disks and corrupted file are not a problem! Advanced restore deleted Mac program empowers user to retrieve digital snapshots, favorite music collection, video clippings, important office documents and other data files from logically corrupted cell phone memory card data storage. ?????? ???????? ???????? ??????? ????????? ???? ?????? ??? ????? ???????? ????? ?? ??? ?? ????? ???????? ???????? ?? ???? ??? ?? ??????. ???? ??????? ??? ??????? ??????? ??????? ?? ?? ??? ??? ??? ?????? ????? ???. This site does not contain serial number, crack, keygen Stellar Phoenix Windows Data Recovery serial number : serial number is the simplest type of crack. A serial number(cdkey,product key,etc) is register the program as you may already know. a crack or keygen may contain harmful software. If you cannot find the exact version you want, just give it a try. for more information read .nfo/.txt/.diz file include in zipped file.